Chichester City reflected on their Southern Combination title triumph – and pledged to give survival at the next level of the non-league pyramid their very best shot. 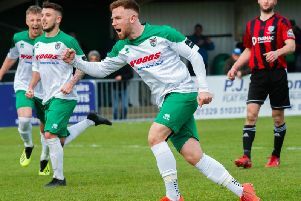 Oaklands Park will host Bostik or Southern League football next season after City clinched the SCFL premier title – their first league championship for 15 years – with three games to spare. Bosses have praised everyone – from the captain to the kit man – who has helped them win the league just a year after going close to running out of money. They warned they were not in a position to start spending big money to stay in a higher league but said with loyal players and the backing of the city and local businesses, they could survive. A 2-0 win at home to Langney, courtesy of goals by Scott Jones and Emmett Dunn, earned City the win that secured the title. Manager Miles Rutherford said a risk he took at the start of the season more than paid off. “We decided to go with a squad of 20 players. We thought we might upset some players early on but we didn’t,” he said. Rutherford picked out assistant boss Graeme Gee, coach Danny Potter and key club people including Andy Bell, Malcolm Harwood, Wayne Dalton, John Hutter, Ian Madgwick and Colin Mills, and sponsors James Lacey and Ben Foukes, for their vital work this season. Club chairman Ash Clack is aware of the challenge the higher league will bring, but thinks the morale of the team will help. He said: “We’ve had a great season. The management have been absolutely superb. “We couldn’t have asked for more. Next year will be a challenge but we’re looking forward to it. Promotion opens up the chance to attract more local fans to the club, and bigger crowds can play a vital role in ensuring the club keep afloat. With previous SCFL finishes of sixth, third and fifth, assistant manager Graeme Gee feels Chichester have achieved what they have deserved for a while. “I think we’ve got our reward for probably two to three years of hard work. I’m delighted for all the people behind the scenes who’ve given up a lot of time and supported us,” he said. First team coach Danny Potter believes home form has been fundamental in the title victory. He said: “We’ve been confident at home. The players enjoy playing here. We’ve got good fans that support us.